The Todas is a stylish fitting suitable for indoor and outdoor applications, available from Eye Lighting Australia , in moist and dusty aggressive atmospheres. 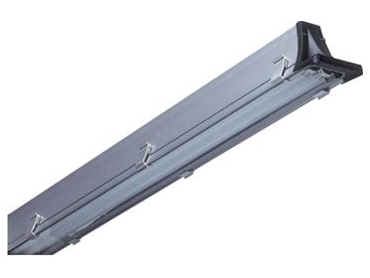 Manufactured from extruded aluminium and fitted with a high performance reflector designed for increased control of light output, the Todas utilises energy efficient T5 linear lamps. Suitable for operating in high and low ambient temperatures, the Todas is created from 96% non-combustible material and is auto extinguishing and 850° glow wire test resistant. The Todas offers surface, wall or pendant mounting arrangements. For easy installation, these structurally strong fittings are supplied complete with two quick fix stainless steel ceiling mounting brackets. For heavy duty installations or those where mechanical vibrations occur, adjustable mounting brackets are recommended. The Todas features an IP66 rating for quality and longevity. A clear toughened safety glass lens ensures high photometric performance. The lens is hinged to the body of the luminaire and features quick release catches to enable easy access to the lamp and control gear during maintenance.